Weymouth Football Club's bid to build a new stadium has moved a step closer after a land dispute was settled. Plans for the Southern League Premier side to relocate to land around their current Bob Lucas Stadium were held up by legal proceedings with developers. Club chairman Chris Pugsley has encouraged supporters to get behind the "several options" now available. "We're now moving on to hopefully getting permission for a new stadium," he told BBC Radio Solent. 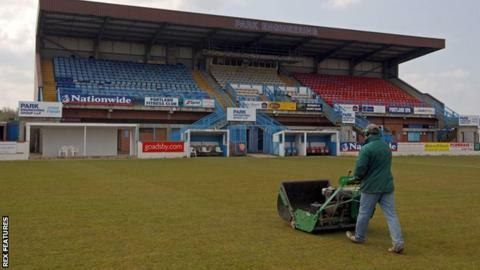 Weymouth, nicknamed the Terras, had planning permission to build a new stadium on a former landfill site rejected in August 2014 over fears of contamination. The new preferred site is subject to negotiations between the club and other interested parties. "Anything can happen," added Pugsley. "Hopefully we can get together and, within a couple of months, get a planning application together for a new 5,000 stadium." If approved, construction could be completed by 2018.